Booklet and course pack for large and small presentation or class, print in size 8.5"x11" at an attractive price. Small or large quantity, color or black/white with choices of paper cover and indoor varied according to your needs. 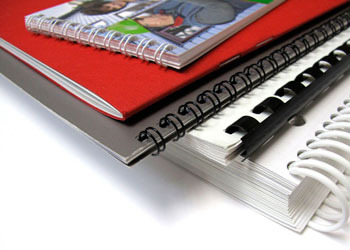 Make the choice of a spiral binding, or folded stapled, or squared to meet the expectations of your readers. We print booklet and course book for students from universities across Montreal, Quebec, Laval, Sherbrooke and Ottawa: UdeM, UqaM, Mcgill, Concordia University, Jewish General Hospital, Saint Mary's Hospital, Sainte Justine Hospital, Instituto Geriatria, and many more! High quality, fast and very cost-effective. The final size of your booklet will be in letter size 8.5X11. The maximum page that a binding can contain is 400 pages. If the file exceeds this limit, the work will be divided into several workbooks. the reason is: "have the currect fee for the Binding"
Please note : there will be a 10¢ (b-w) and 39 ¢ color charge per print for all additional pages that you did not specify or calculated when you placed your order online. There is 60¢ extra charge for trasparent sheet.